So last week I had a first look at some of the science of the biological passport, and specifically the legal aspects of how that science is interpreted. Thanks for the great discussion to that post, and especially from those who “dropped by” to share some insights from the passport team itself! As is often the case (always, maybe), your discussion is twice as good as the original post! Also, I’m unashamed to admit that on this particular topic, I can’t even deliver satisfactory answers to many of your questions! It’s clearly a mighty complex topic, and one that discussion will help grow understanding of. So today, we forge ahead with what I ended off on, and that it is the question of whether the passport is worth the effort, or whether the cyclists are able to “dodge” it so effectively that it’s just another attempt by the doping control to catch the dopers from behind. The principle is that it is possible to detect the effects of doping without ever having to find the drug. To gather the evidence, so to speak, rather than having to find the smoking gun in the hand of the accused! Each rider is measured throughout the season, and their values set what you might call “basal levels” because we know that when it comes to blood, there is only so much variability from one test to the next. That is, you don’t go from a Hb concentration of 160 g/L to 190 g/L without suspicion. So a trace of a rider’s values that is developed longitudinally (over time) should NOT resemble a mountain range with huge peaks and valleys! The key point here is that each rider’s values then set a range of probabilities for what a subsequent reading should be – the athlete is his own reference. A probability limit of 99.9% which means that a value outside of these boundaries (an upper and lower boundary) is correct 999 times out of 1000. Put differently, the chance of finding a “strike” or suspicious result in someone who is NOT doping is 1 in 1000 samples. To illustrate, below are two actual samples off the Biological Passport software. The left one shows a clean, non-doped athlete, the right shows doping, with an athlete who has a total of 7 “strikes” against him (1 for Hb, 3 for the Off-hr score and 3 for Ret %). For more explanation of these strikes and the upper and lower probability limits you can see, refer to my previous post. So that’s it in a nutshell – the issue now is whether those “security levels” render the passport ineffective. Is it doomed to be another control that clever athletes dodge with ease or has it had an impact? For example, if the probability limit was set at 99%, then far more samples would be classified as “strikes”. It would also mean a 1 in 100 chance of false positives, the downside. Allow me an analogy. Say you have a stretch of road that is known to be a high accident zone as a result of speeding – guys hit 100 mph in the 70 mph zone. Authorities might decide to install cameras to catch people speeding. They might estimate that in a given week, an average of 500 cars speed through this section – it’s impossible to know the precise number, because it can’t be documented. Having installed cameras, they review the statistics and find that they are now catching 2 speeding cars per week. A failure? Are they looking in the wrong place? Not necessarily, for the obvious reason that as soon as drivers know that the risk has increased (provided they also believe that the punishment will be enforced if they offend, of course), they modify their behaviour accordingly. This is an obvious and simple example that just because the passport is not catching doping cyclists, it may actually still be exerting an effect on the professional peloton as a result of what I would crudely describe as “fear” that this new system can catch dopers. Doping behaviour would thus be modified as a result of awareness, and the end result is that authorities might catch FEWER transgressors, but should still feel content that they’re getting a problem under control. Will people still speed? Of course. But will they speed less severely, and try to speed only when not being observed? Yes, and the end result is positive. Similarly, cyclists will dope, there is no doubt of this. But they will be more careful, and that has positive consequences. But, you are not going to just take my word for it (nor would I expect this! ), so let’s look for some evidence. If the cyclist is changing their behaviour in response to the increased chance they will be caught, then you can expect to see changes in the markers that reveal the EFFECTS of doping. In other words, you apply the Biological Passport concept, and investigate whether things are changing. So, what are you looking at? The green blocks show abnormal samples where reticulocyte percentage is HIGHER than normal – either 2 to 2.4% (light green) or above 2.4 to 5% (dark green). Remember that a higher reticulocyte % means more immature blood cells, suggesting EPO use or blood removal. So quite clearly, in 2001 and 2002, you had a high percentage of samples that suggest EPO use – between 9% and 11% of all samples, and 80 to 90% of suspicious samples. No surprise there. So clearly, the EPO test changed things – from 2003 to 2007, between 6% and 10% of samples had low reticulocyte %, and these tests make up 80 to 90% of the abnormal test results. Remember, this suggests blood doping, and a shift in practice after the EPO test was introduced! 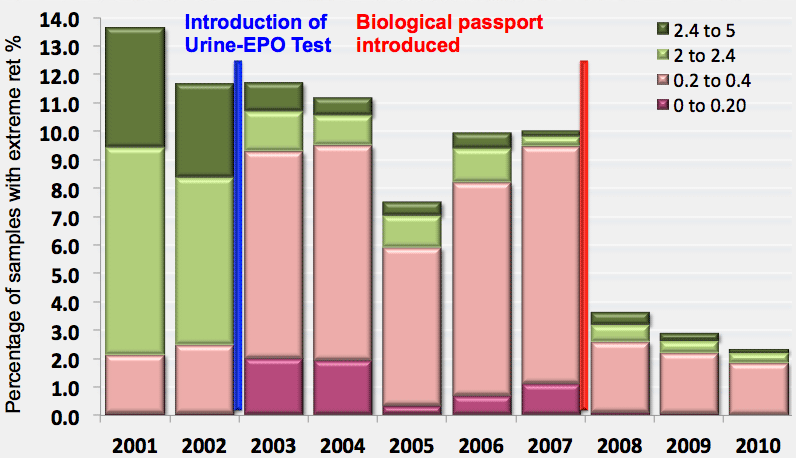 Then comes the Biological Passport, shown by the red line in 2008 and a substantial drop in the total number of tests with abnormal reticulocyte %. This is clearly a good finding, because only 4% of all tests have unusual reticulocyte percentages, a drop from 14% in 2001. That’s an enormous impact, and while it does not prove that doping is reduced, it does suggest that the Biological Passport has had a measurable and expected impact on the sport. And there is the “elegant” timing where the introduction of a test first shifts the trend from high ret % (EPO use driving RBC formation) to low ret % (blood doping which suppresses RBC formation) and then seems to bring it right down. This strongly suggests that professional cycling has adjusted its behaviour in order to avoid detection, not once but twice – the first was a change, the second a reduction. The threat has therefore induced change. But there is more to this – it’s linked to performance, and that’s something I will pick up below. But first, an important question. Does this prove that doping is not happening? Of course not – riders are smart, they micro-dose, they mask doping by using EPO to switch RBC formation back on when infusion would normally switch it off. There is still corruption, and no science, however powerful will be 100% effective if there is any hint of cover-up. Going back to my speeding analogy, people will always speed, but instead of hitting 100 miles an hour, they pull back to 80 miles an hour, and they “select” when to speed. Traffic officials will still accept bribes, officials will cover up some cases, but the overall trend would still be positive. I would propose that a similar thing has happened for cycling. There is almost certainly doping, and I will remain a skeptic, but I’m also optimistic that this new method, which will continue to be developed and improved, is having an effect by forcing more caution, and smaller dosages. That optimism comes in part from this graph, from testimonies within cycling (I honestly believe that cyclists are “nervous” of the science behind the Passport), and of course, performance, which I’ll end off with now. You may also recall the great discussion we had during last year’s Tour de France, where I proposed that the Tour of 2010 was one of the slowest in many years, based on power output measurements from top riders and estimates from previous years. That all began with the hypothesis that the power output achievable without doping was limited and could be predicted based on physiology, and that any cyclist who went above this on a long finishing climb in the Tour was probably doing so with the benefit of doping! That “limit”, I suggested, was about 6.2 W/kg, a climbing power output that was very common in the 1990s and early 2000s, but which has NOT been seen since about 2006. 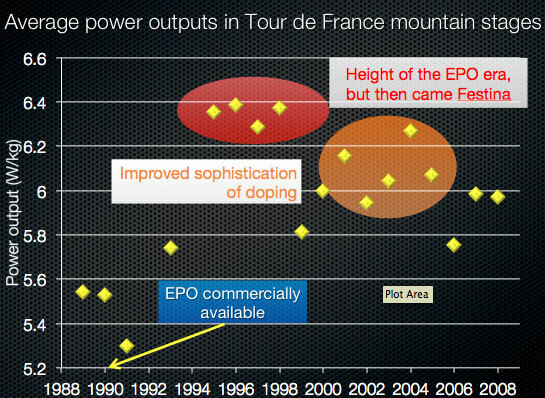 The graphs below show the power output in the mountains, year by year. I haven’t yet added the 2009 and 2010 figures, but it illustrates a point. And from our analysis in 2010, the highest power output achieved on a given mountain was ± 6W/kg, while the average is in the range of 5.7 W/kg to 6 W/kg. Much slower than preceding years. 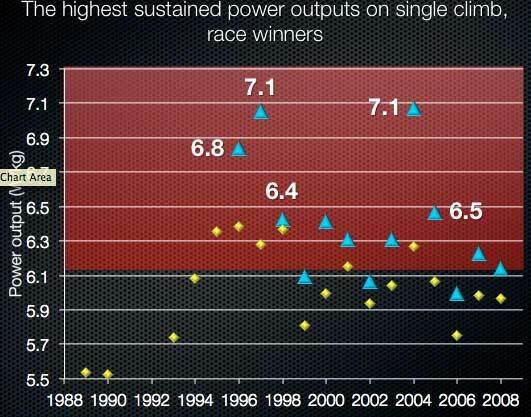 The top graph shows average power output of the winner of the mountain stages, and the bottom shows the highest power output on a given mountain stage for the race winners. Again, read back to our discussion of the “limit” and you’ll get a picture for how the sport is slowing down. It all builds a picture. Eradicating it? No, not at all. And cases like those of Alberto Contador don’t inspire confidence in the judicial process. Nor do riders like Ricardo Ricco, or Patrick Sinkewitz, or any number like them. The historical problems will not disappear overnight, particularly while many who were involved in creating the sport’s doping culture either deny or continue to benefit from it. But performance changes, and the initial results from the ABP do give cause for some optimism. Obviously, the novel methods must be further improved – if doping control stands still, it will fall behind, because the incentive to cheat (and find new, clever ways of cheating) exists. And you can be assured that this is happening – research to improve confidence limits, to tighten security and allow more certain limits to be set, to understand the physiology and pathology of blood values will help in future. But for now, I hope I’ve given cause to suggest that the Biological Passport is not a failure by virtue of “catching” few riders. It’s strength is in its longitudinal programme, and the science, and the fact that some smart people are tightening the boundaries. P.S. As an addendum, the reference used for those ABP profiles in the post as well as the reticulocyte graph is below. I might add that it’s a great paper to read to find out about the ABP. It has details on how testing is done, quality-control, how many samples have been done and how they have impacted the sport. It’s likely that a lot of questions will be sent to that paper for an answer! And once again a huge thank you to Prof Yorck Olaf Schumacher, Prof Mario Zorzoli and also to Torben Potgiesser for their input. I don’t know if any of you realized, but some of the comments in the discussion to the previous post were from them, and that is a rare privilege, to hear straight from those at the “front line” of the issue at hand. I am especially indebted to Prof Schumacher for steering me to publications on this topic.